BNG Member Special-Receive 20 free Book boxes with a confirmed booked pack with My MAD Packers! Call office for details! 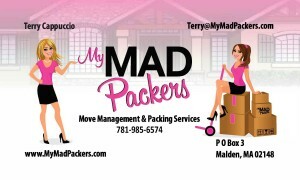 My MAD Packers provides move management and packing services for residential and commercial clients. Whether you’re moving to a large home or downsizing to a small apartment, moving to a new office or relocating your entire company My MAD Packers can assist you with all your packing and move management needs. Careful and efficient, My MAD Packers eases the frustration from the often overwhelming and time consuming chore of packing & unpacking. Recommendations from our solid network of professional movers will complete the process of moving you safely and economically. We are committed to a caring and dedicated service with a few belly laughs and a just a sprinkle of madness!